For some drivers, storing their car during the winter is a smart investment; it can protect the vehicle from harsh weather conditions. The chilly winter air can damage many of your car’s components. Although we touched on this subject a few months ago, we want to provide even more in-depth information about why keeping your car out of the rust-inducing salt, slush, and sludge might be a smart move. Storing your ride does not simply mean parking it inside a safe, warm space until springtime. There are important steps you need to take to keep your vehicle in pristine condition while it is safely kept in storage. 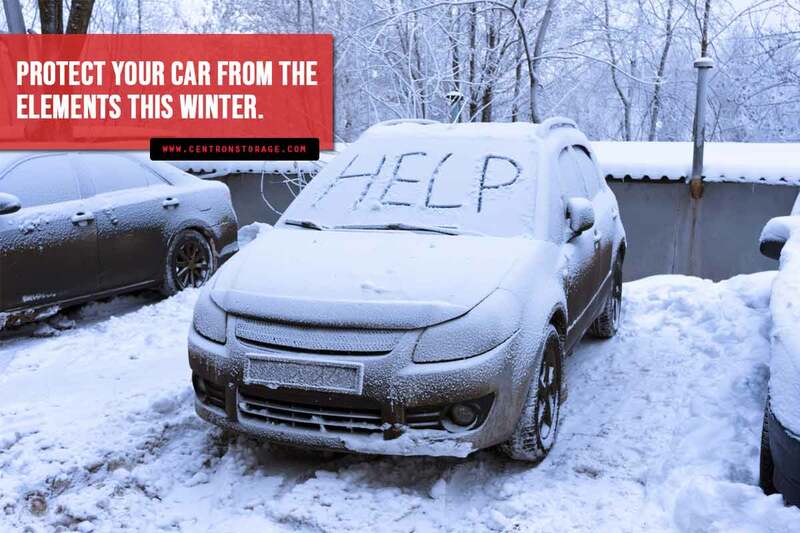 Here are some quick tips to get your car ready for wintertime hibernation. Park it in a dry, clean area – If you do not have extra space in your garage, do not leave your vehicle outside. Renting a storage unit ensures it will be protected from inclement weather. This can be a worthwhile investment. A good storage facility must have concrete flooring. It must also be dry, clean, and properly maintained to prevent condensation buildup. The space does not necessarily have to be climate-controlled, but that can certainly help your car during the subzero temperatures. Clean it thoroughly – Clean your vehicle properly before putting it into storage. 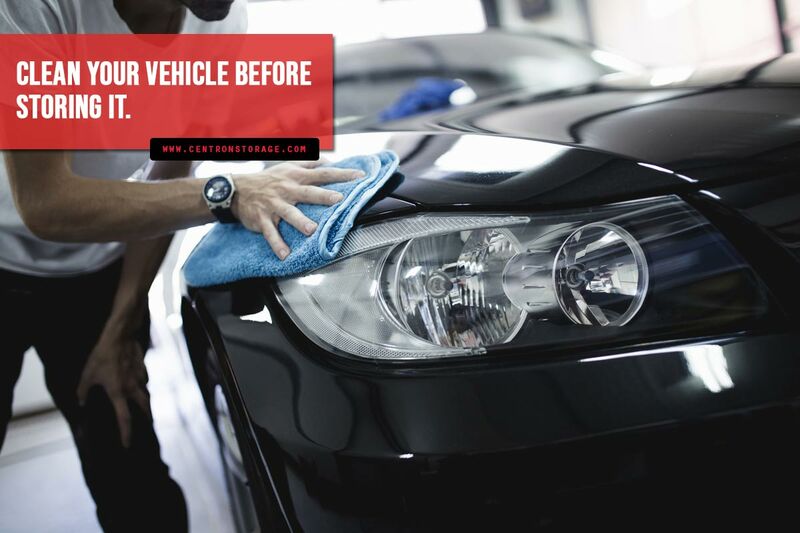 Hand washing and waxing protect your vehicle from corrosion and damage to the paint. Wash the undercarriage, fenders, and wheel wells to remove dirt and grease. Minor water stains can permanently damage paint jobs, so be sure to completely dry your car after washing. Roll up the windows and place boxes of baking soda in the trunk, glove compartment, and cabin to prevent a musty odour from developing while your car is safely tucked away for the winter. Keep the pests away – After cleaning and drying the vehicle, take steps to repel pests — especially if you opt to place your car in your home’s garage, rather than a storage facility. Insects and animals seek a safe and warm place to settle during colder weather. Close doors and windows tightly. Wrap or stuff steel wool inside the air intakes and exhaust to prevent critters from crawling inside. Avoid pushing the wool too far in; you will want to easily pull it out again come spring. Placing mothballs nearby can provide an extra layer of pest control. 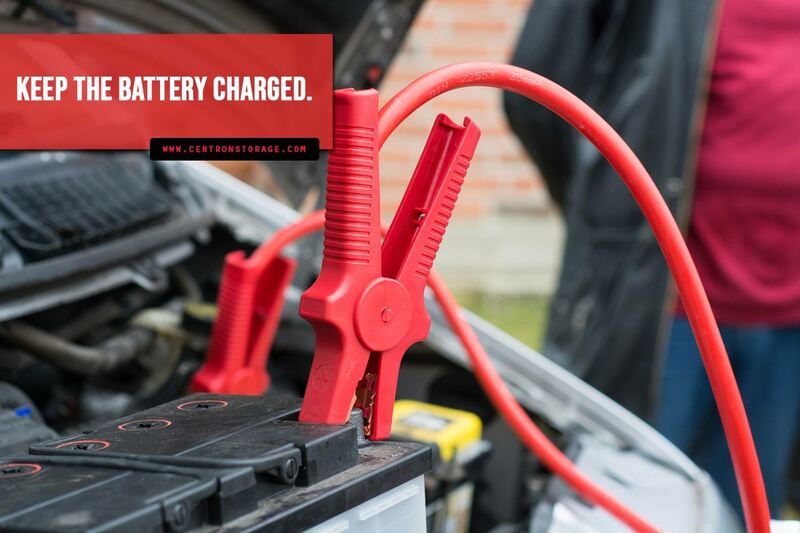 Keep the battery charged – Improperly storing your battery could reduce its lifespan. A complete discharge, especially in winter, could result in permanent damage to its cells. The best option is to periodically run the engine. This will keep it fully charged and recirculate the fluids. If you cannot let your engine run where the car is stored, there are other options for protecting your battery. A trickle charger or a battery tender can prevent full discharge. Wherever you store your vehicle, leave it attached to one of these options. They should have an automatic shutoff feature to prevent overcharging. You could also remove the battery and store it separately. If you store the battery away from the automobile, keep it elevated rather than in contact with the concrete floor. Prop it up – Letting your vehicle sit for a long time can cause damage to tires. To protect them, rest the car on jack stands rated for its GVW (gross vehicle weight). Place wheel chocks behind the tires and loosen the lug nuts (without removing them). 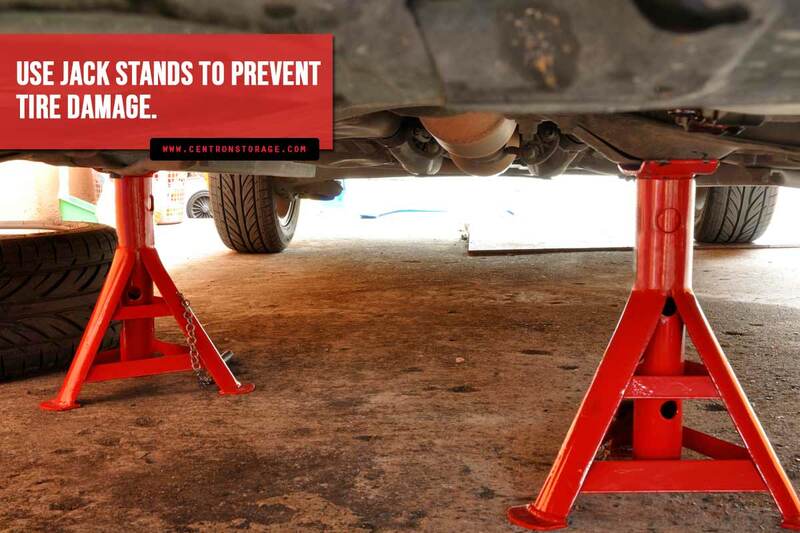 Using a floor jack, raise one end of the vehicle, and place at least two jack stands under the car’s safe lift points. Once the stands are in place, slowly lower your car to let it rest on them. Repeat this process on the other end of the vehicle. When it is firmly resting on the jack stands, remove the lug nuts and take off the wheels. Store the tires in your garage or basement. Avoid using parking brakes – If jack stands are not an option, do not use the parking brake to prevent the parked vehicle from rolling. This could cause stress to brake pads (potentially fusing the pads to the rotors or snapping the brake cables). Instead, place tire chocks behind the wheels, in the direction of the floor’s slope. Top up the tank – Completely top up the fuel tank to prevent condensation and keep internal seals lubricated. Fuel stabilizers prevent corrosion in the fuel system and help keep the gas fresh for up to a year. Change fluids and the oil filter. Ensure you have enough antifreeze to protect mechanical components and fluids from freezing. Run the engine to thoroughly circulate the fluids before storing your car for several months. Tuck and cover – Even when storing your automobile in a secure storage facility, investing in a quality car cover is a good idea. Do not use a plastic tarp — it can scratch the paint job. A proper cover prevents dust and dirt from accumulating on your vehicle’s freshly waxed exterior and can act as protective padding. A high-quality, breathable, model-specific cover works best to prevent moisture buildup, but a universal cover is likewise better than a bed sheet or tarpaulin. 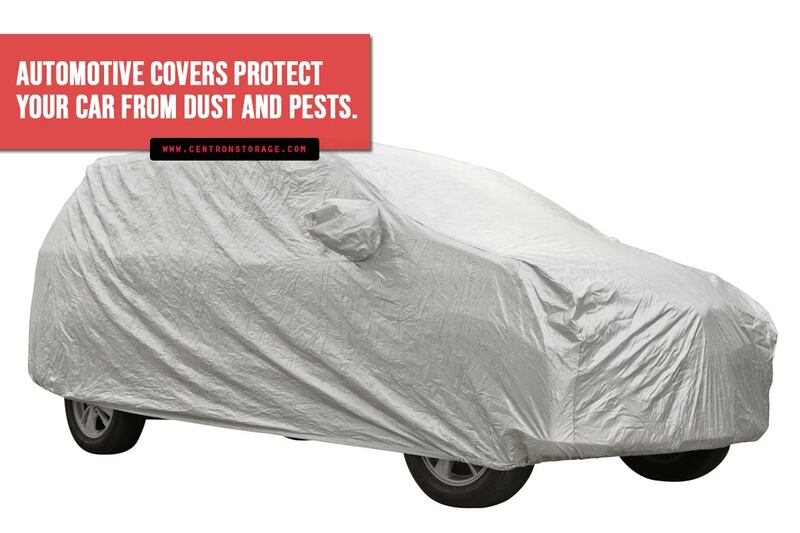 Custom-fitted and universal automotive covers can be bought at most auto parts stores, online or in person. Superior Service – The staff should be friendly, ready to help, polite, and knowledgeable. Security – The venue should be equipped with 24/7 modern security features (surveillance system, gate, fence, security personnel, fire alarms, etc.) for your peace of mind. By taking the time to research your options, you will be better able to find the perfect storage options to keep your car throughout the winter season. Centron Self Storage provides secure, affordable storage units in Toronto and North York. 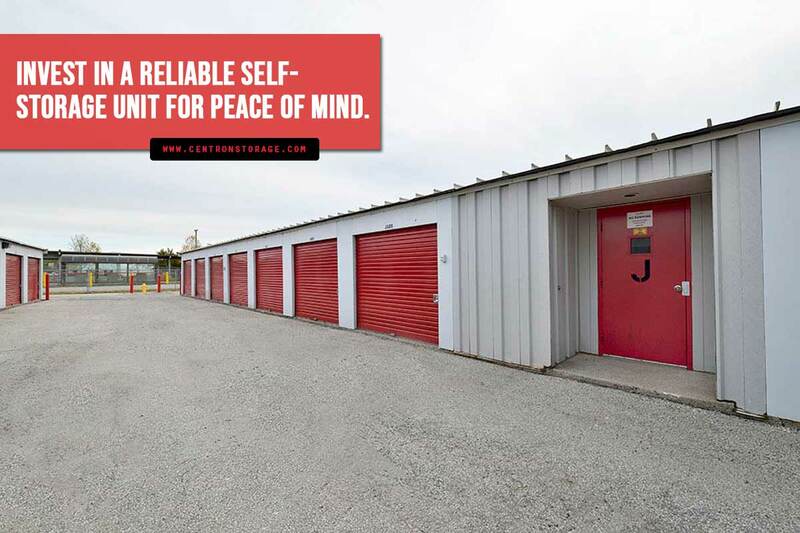 We have state-of-the-art facilities, a variety of storage unit sizes, and incredible staff to assist with your needs and keep your valuable possessions safe 24/7. Use our storage calculator to determine the exact size of the unit you need. Call Centron Self-Storage in Toronto at (416) 690-8585 or in North York at (416) 739-0000. We often have a discount offering the first four weeks’ free on select units.